Just when we think we've seen everything, shop friend and AC masters rider Jeff comes in with something mindblowing. Jeff took his Above Category team bibs in for a little upgrade and brought them back to show us. 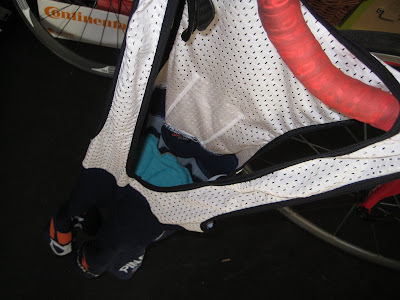 Yes, in his pursuit for ultimate riding comfort, Jeff cannibalized a pair of Assos F.I. 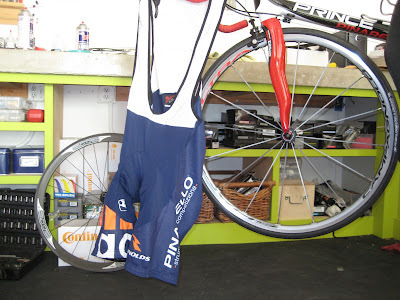 Mille bibs and installed the Assos S5 chamoix into his AC team kit. Now that is style you can feel. 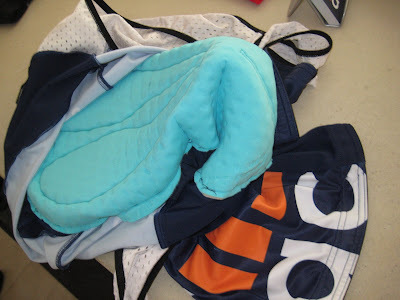 News of Jeff's ingenuity spread via the internet across the pond and within hours we received a follow-up picture snapped from deep within the Assos factory... If it's good enough for Jeff, it must be good enough for the pro's.